Yeah, even we try and get into the holiday spirit here at Post Academic: I came across a story about how Tom Fenton, a grad student in sports business and volunteer hockey coach at Manhattanville College, ended up playing a game as a backup goalie for the Phoenix Coyotes, at Madison Square Garden, no less. Fenton was a junior hockey player in his native Canada, then was a goalie at American International College — where my dad used to teach math, actually. 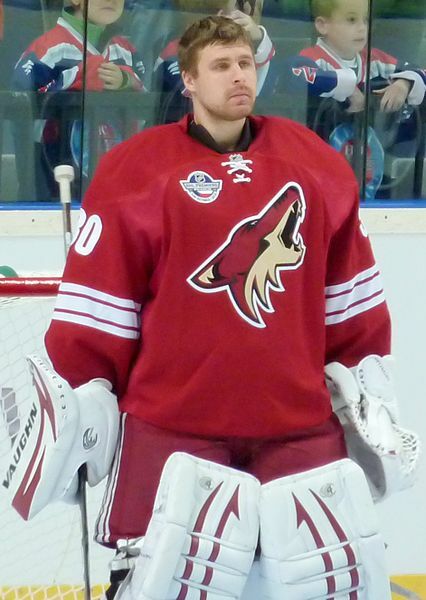 So apparently what happened was that the Coyotes’ starting goalie had the flu, but they couldn’t call up a player from the minors (or whatever they call it in hockey) in time for the game. Enter Fenton, who was basically in the right place at the right time: A Coyotes scout, a coach of a friend, was frantically looking for an emergency goalie to fill out the lineup, and got hooked up with Fenton, who was in the area. Fenton fit the bill, since they couldn’t use another pro player or a college goalie who would lose his eligibility. After receiving call after call while getting a haircut — see, he listened to Eliza’s advice to let unknown calls go to voice mail — Fenton returned the message to find out that the first time he would be playing competitive hockey since he graduated college in 2009 would be in the NHL at MSG. But get this, the NHL might be the only organization cheaper than a state university: Under some rule, Fenton wasn’t allowed to be paid and his very short stint was only considered an amateur tryout. Anyway, he didn’t into the game, so it was probably a moot point. Here’s hoping, though, that he at least got a lot of souvenirs, beyond the experience and some nice write-ups. As for a Post Academic equivalent, getting a call to play in the NHL out of the blue would be quite the same as getting a tenure-track position at an elite school, even if you’re in the same league as the best of the best for one night. I don’t know, maybe it would be like guest lecturing at your dream school for a day or something — which you probably wouldn’t get paid for, either. Another, better way to think about Fenton’s story, especially during this time of year for MLA’ers, would be to never give up on getting the call you’ve been hoping for. Or, rather, maybe your cell will finally ring precisely when you’ve stopped waiting for it and aren’t expecting it to any more.